The therapy involving the Insulin pump is being used by many thousands of people over all ages. There have been many case studies that have shown to enhance the management of the glucose results to those patients who use the insulin pumps. Though, it offers the person with more sense of flexibility in their lifestyle. The potential energy to wipe out the fluctuations of the glucose in the blood is also sometimes experienced while injecting the insulin. The Insulin pumps have become very popular among people who are affected by the diabetes, generally with type 1 diabetes. This is because they will have the important benefits than the injections, thus having a regulated control over the diabetes mellitus. The Insulin pumps are not well suited for all people because there are many disadvantages that have to be taken into consideration while deciding their usage for them. The modern improvements in technology have led to compact and fit external insulin pumps that are very convenient to use. This makes them a correct choice to carefully place them in the belt or pockets of patients. There are some pumps that are in the size of a pager. The insulin will secrete from the reservoir in the pump via a thin tube to a soft catheter inserted under the skin. This will supply regularly the needed amounts of insulin. Besides, the people who wear the pump presses a button to release a supplemental dose before each meal. The dose can be adjusted accordingly. 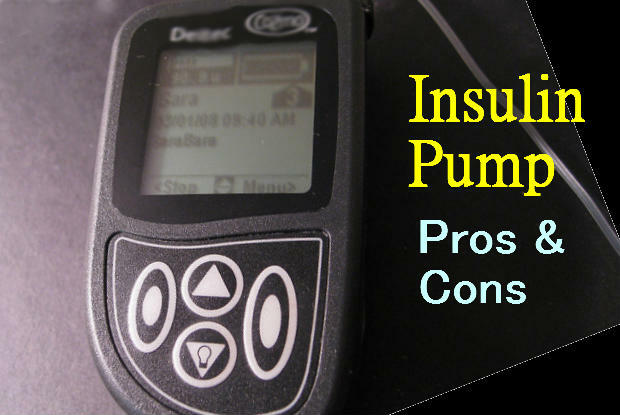 The following pros and cons of the insulin pump must be carefully considered before being administered to them. The insulin pump will eliminate the need to inject the insulin with a syringe. The multiple injections need not be administered every day. The needle of the insulin has to be reinserted once in every three days. This is more than enough. There are some cases in which the doctor will suggest to reinsert them once in every two days. Receiving a normal decreased dosage of the insulin all hours a day will make a person not prone to the fast reduction in the glucose levels that will occur after injecting the insulin with the needle. The usage of the insulin pump will sometimes enhance the A1C, which shows the normal range of the glucose level in the blood. There are times when the people cannot restrict eating at odd times. Even at times, there may be some instances that will make the people to skip the meals. So the insulin pumps can be used to get accustomed to the facts. This is due to the fact that the pumps use the insulins that act fast, the bolus will be covered by a meal with pressing a button. The people need not pin their body with the needles. It is also very great to manage their own levels of insulin rather than getting monitored by the needle. The reactions of low sugar levels are called as hypoglycemia. There are dangerous risks that are associated with the hypoglycemia with the dose of the injections. So the larger doses of the insulin must be taken one at time. The regular flow of the insulin in the pump will supply the decreased risk of low sugar. It will be particularly helpful at night time. This is because injecting the insulin will trigger the risks of the decreased reactions at the time of sleep. Now that the insulin pump does the job by supplying the insulin, there is no need to eat high amounts of foods that are rich in carbohydrates. And the person can also do some physical exercises with the insulin pump intact. This will never disturb them in any way possible. The people who inject the insulin into their bodies may worry about the precise amounts of the insulin that has to be injected. But with the insulin pump, the needed amounts of the insulin will be injected into the body without any impulse. Since the insulin can be adjusted, the diabetic patients can eat any food that they wants. This is the flexibility to have with the meals. The foods that the people were unable to eat formerly can be now relished. If the people like to eat any dessert, then they may very well eat them with no consciousness on the extra work that has to be done. Though the pros of using the insulin may seem to be superfluous, there are also some disadvantages that make the people to think before undergoing it. When the site of the insertion of the cannula is not changed regularly after two or three days, then the person will be affected by the risks of infection. There have been many people who have been affected by it. But it is not the fault of the insulin pump but of the negligence of human beings. As long as the needed and the exact procedures are practiced, the skin infections will be rare. They will also be undesirable and fatal in case they happen. This is particularly true at the first few months of using the pump. The testing that takes place frequently is the only way for a person to ensure that the basal rate and the extra insulin are as planned. There are certain actions that will get hindered by wearing the insulin pump. The minds of the people will only be occupied by the thought of handling the insulin pump and so they will never be able to focus on their other activities. The actions that hinder are the idea of sleeping, running, active participation of any physical exercise and taking bath in the sun. The news is that the people can also disconnect the insulin pump to be able to work. The pumps can be disconnected for a short time and there is no problem with that. Being disconnected from wearing the insulin pumps for a long period of time can increase the glucose level of the blood. There are people who will never check the glucose level of the blood and this will also result in increased level of the glucose. Due to the accumulation of the insulin of the body, the weight of the person will increase gradually. This is a risk that is inevitable to avoid. As with the case of any medical instrument, the price of the insulin pump is very high. The normal people cannot afford to buy it. So this has been considered to be the most backsliding disadvantage of the insulin pump. The amateur users of the insulin pumps have a lot to learn during the initial stages of using the insulin pumps. There will be some difficulty in moving to the usage of the insulin pumps. The first few days will be very challenging as the people must change the sets of infusion, setting your basal rates and avoiding from certain problems. This is like the formation of bubbles, air in tubes and having a cannula that is blocked. In case if the person does not get sufficient amounts of the insulin supplied to them, it will result in increase of the ketone levels and the high risk of the problem of ketoacidosis. Even though the pumps will provide the best opportunity to control the diabetes, in normal terms, this will require testing of the blood glucose levels frequently. Four times, the test can be done in a day. It is good to note that achieving the best control on the many injections that are done daily will likely need testing often also. This is the most serious and the unfortunate disadvantage of using the insulin pumps. The tubes will often be long. It will be inevitable to catch hold of the tubes of the pump or the other aspects of the insulin pump. This can happen many times in a row. This will pain a lot and will leave that place to be sore for a very long time. The use of the injections can be done every three days. The risk of changing the sites of infusion takes more time than administering an injection. This will be very troublesome. If the insulin pump gets attached to the body all day long, then the people will develop a sense of feeling that they suffer from the diabetes. The other person, too who see it can easily know that the person suffers from it. This will be very insulting at times. The diabetic patients must consider the pros and the cons very carefully and get to know the valuable advice from the doctors. Only then, they must take any decision.